Roscommon forward Ciarain Murtagh is looking forward to clashes against Tyrone, Donegal and Dublin this month. 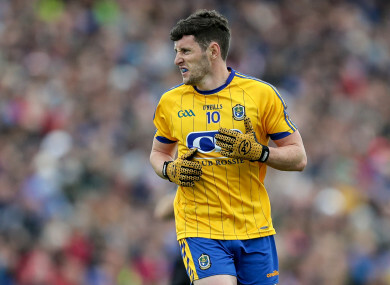 ROSCOMMON’S VICTORY OVER Armagh at the weekend safely sealed their passage into the Super 8s, where they’ll face Tyrone, Donegal and Dublin over the next four weeks. In-form forward Ciarain Murtagh, who clipped over six points against the Orchard County, is looking forward to the huge challenge awaiting Roscommon. “It is going to be a massive test. You are going to be getting nothing easy next week but it is great to be going up to Croke Park and we get to express ourselves up there and see how we get on. “To get into the (All-Ireland) quarter-finals is massive for us. If you are not there, you can’t be going around saying you are a top eight side. “We will relish the chance of playing against the top teams. Tyrone next week, Donegal the following week and then Dublin, I mean that is what you dream of when you start out playing football. “We always wanted to get to the Super 8s but we are not there to make up the numbers now. We will be going out to express ourselves. Every man will be driving it on this week to try and get into the 26 next week. It is going to be a massive few weeks for us but hopefully we can drive it on now. Kevin McStay’s side put their Connacht final defeat to Galway behind them and posted 2-22 against Armagh to reach the last eight. Murtagh’s younger brother Diarmuid also contributed six points, while Enda Smith bagged two goals. “You never go out to have a shoot-out with anyone, especially against Armagh because you know the dangerous forwards that they have. We would not have set up to go engage in a shoot-out that was just the way that the game went. Email “'That is what you dream of when you start out playing football' - Murtagh relishing Super 8s”. Feedback on “'That is what you dream of when you start out playing football' - Murtagh relishing Super 8s”.